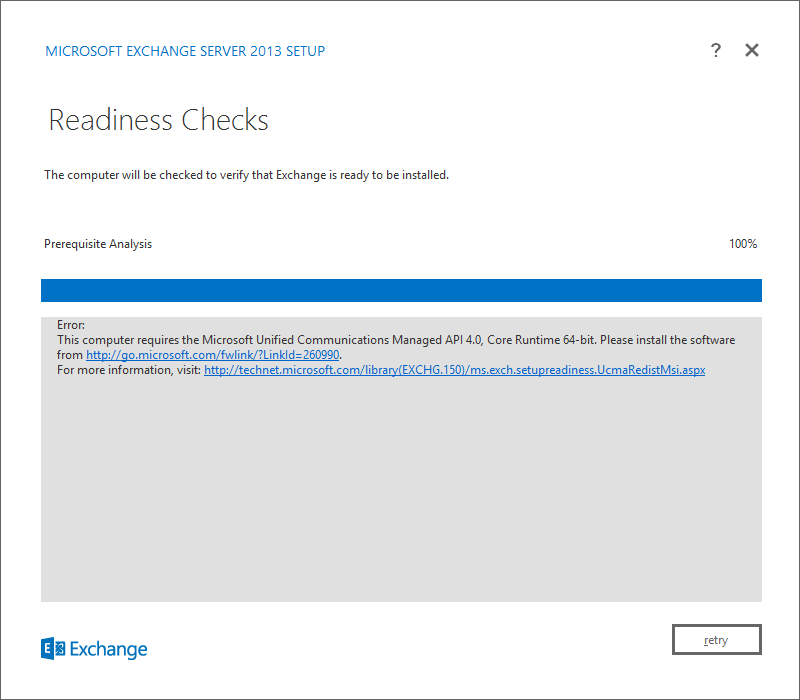 When installing Exchange 2013 servers in complex lab scenario, I decided to separate Mailbox and Client Access server roles to dedicated servers running Windows Server 2012. I installed Mailbox server role first and then proceeded to install Client Access role. Since Mailbox server role installed fine using setup UI and required windows components installed (since I had the option checked in the wizard, I did have to install office filter packs and UCMA manually), I decided to trust the setup wizard to install windows components for CAS role for me. Well, what do I know? To my surprise, the setup halted on prerequisite analysis step complaining that UCMA wasn’t installed. I did have to install UCMA myself so I was actually happy to see this and proceeded to install UCMA manually as I had also done on Mailbox server. That’s when I got bad news from UCMA setup. 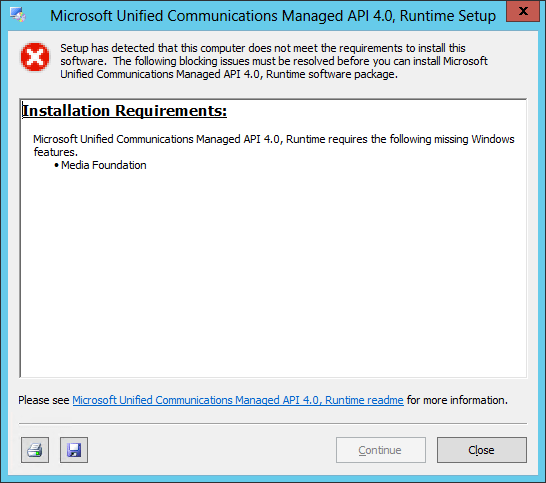 UCMA setup complained about missing Media Foundation which is a pre-requisite for UCMA installation and should have been installed with required windows components that I assumed setup UI installed. I didn’t need to investigate as it was obvious UI didn’t install required pre-requisites. I was however perplexed that setup didn’t do what is should have done. Could it be an anomaly? Am I missing something? I didn’t have internet access on that lab VM. The setup could not check for update. Was this fixed in an update I am not downloading? To rule that out, I provided internet access to that VM and ran setup again, this time selecting update option. Setup quickly came back to tell me there were no updates available. I haven’t tried unattended mode of setup yet. So I decided to try that with an obvious /InstallWindowsComponents switch. As you probably know by now, guess where that got me… NOWHERE! The only option I was left with was to install pre-requisites manually as mentioned in TechNet article: http://technet.microsoft.com/en-us/library/bb691354(v=exchg.150).aspx#WS2012CAS. Everything was good after that. It remains to be seen if this will change in future with setup updates. Till then, I gotta have a setup script like one I have for Exchange 2010. Hurry up Pat Richard.